I wanted something light, after a few dark, heavy reads and this was perfect, letting me relax while reading, lifting my mind up to bright and happy. Its not all smiles though, there’s some pretty sad moments, very real issues that will face many of us at some point in our lives. So we start on holiday with Leah, and her sister’s family. It ought to be wonderful, relaxing, lazy days by the beach followed by nights spent with good food, wine and conversations. Well, that’s what * should * have happened. Instead poor Leah finds herself being a temporary parent to teens Jordan and Natasha, while her sister makes sporadic, desultory attempts to sort her life out, and her brother in law is mending a badly broken ankle…. Thankfully next door provides a distraction in the shape of hunky Ronan and his teen son Curtis. Michele, Leah’s sister is a selfish woman. She’s two lovely teens – well, lovely as teens can be ;-), a husband who’s a kind, caring, responsible man and yet like many she’s discontented, has thrown herself into an affair with a younger man. Now she’s pregnant with her formerly happy, easy life strewn around her in ruins, blaming everyone but herself. I was so angry with her. I haven’t patience with the “we just fell in love” mantra. There’s always a point when the harmless glances and occasional flirty chat moves forward, and its at that point a spouse should stop. Its not hard. just do the right thing. Of course that’s not what they want, and Michele moves forward telling herself they can’t help it, ignores the heartbreak she’s going to rain down on her lovely family. Sort your family issues out first is my solution, then once you’re separated there’s time for someone new. And that’s my rant over, but you can see why I was so angry at Michele. Right from the start she’s leaving Leah to do everything; shopping, cleaning, cooking, looking after the kids, citing morning sickness and feeling unwell as an excuse to stay away from anything resembling work/responsibility. She’s actively jealous of Leah’s career, her child free life, but as Leah reminds her, she chose a different route, she shouldn’t be expecting Leah to take over her life now she doesn’t like it. 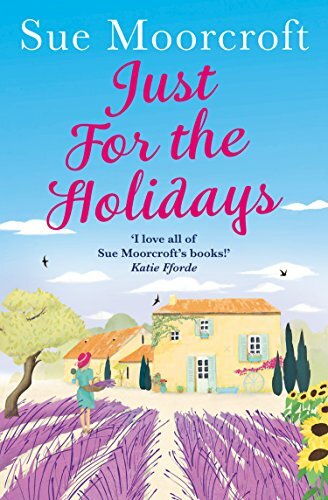 Her husband Alister is a lovely man, adores his kids and is trying hard to be civil, but his world has crashed and Michele isn’t making things any easier. Teens are a mix, grown and wanting to be adults one moment but still kids inside and Michele’s actions have a huge impact on them. Then there’s the family next door, Ronan and his son Curtis. Curtis soon throws in with Jordan and Natasha, and the three are together having fun most days – and evenings. Leah’s cooking is fantastic, she’s a trained chef, and soon they’re spending mealtimes with the family. Ronan and Leah are attracted but the course of true love and all that…hasn’t hardly time to run smooth here with all the things being thrown up against it. Its a fabulous read, heady warm summer days abroad, fabulous food – and lots of decadent chocolate desserts. The characters are a real mix of families, ones we all know, issues many of us have faced one way or another, and throughout I was rooting for Ronan and Leah, they’re two great guys and deserve each other. They’ve both been let down badly by others in the past, Leah especially is affected still by a past relationship that went bad, so though I wanted them to be together I kind of sympathised when I could feel her drawing barriers up. A story that was fun, felt very summery, with real characters, ones we know, can feel have genuine issues and problems that face many of us at some points in out lives. Stars: five, a fabulous summery read, with real people and genuine scenes.